TOP > blog > SAFETY TALK. H20 is Life. SAFETY TALK. H20 is Life. 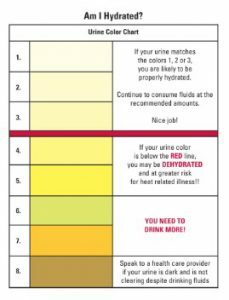 If your urine matches the color below the RED LINE on the chart (4,5,6,7,8) it means you need to drink more amounts of water. For me, I am not afraid to eat or drink anything as long as I maintain the color of my urine above the RED LINE on the chart (1,2,3), I know that my health condition is good. Make drinking water a habit. It is for your own health.